WSPA (World Society for the Protection of Animals), a UK based charity, is currently working with Mr Fakhar Abbas and the Bioresource Research Centre of Pakistan (BRC) to permanently end the tradition of bear baiting in Pakistan, and therefore the world. Together it is working with wildlife officials, local religious leaders, political key figures and former bear baiting organisers on a comprehensive project to strengthen enforcement and legislation, increase public awareness, support alternative livelihoods for bear owners, and provide sanctuary for the 70 bears still forced to participate (at the Balkasar Sanctuary). This project tackles not only the direct animal welfare issues, but also the wider societal and legal conditions that have allowed bear baiting to continue in Pakistan. Bear baiting events are attended by a small minority of the Pakistani public and are organised by an even smaller circle of influential landlords. WSPA and BRC have been trying to increase community support for an end to bear baiting by presenting this relatively small audience with compelling information about the ethical, religious and animal welfare implications of this practice. Simultaneously it is reaching out to the landlords involved in organising bear baiting events, encouraging them to give up their involvement in this cruel practice. Most baiting events are organised and hosted on land owned by powerful and influential local landlords. Gaining their support for an end to the tradition of bear baiting is therefore a highly important aspect of WSPA’s work, but also extremely challenging. BRC networking teams, accompanied where possible by religious leaders, visit landlords to gain their support for the project by explaining the ethical and religious implications of bear baiting. Some of the landlords who have pledged to stop hosting events are now even using their influence to actively encourage other landlords and bear owners to follow suit. In 2012, WSPA enrolled selected religious leaders in a coalition to approach specific landlords and persuade them to give up this practice from a religious stand point. It had some success with this outreach. These religious scholar teams visited five active bear baiting landlords in 2012 to directly make them aware of the religious concerns of their activities. All five landlords over time agreed to stop their engagement (this will need to be monitored, obviously). To date, over 300 landlords have pledged not to engage in the hosting of bear baiting events. Despite this success a small circle or landlords remain intransigent and continue to hold bear baiting events. WSPA has done some analysis of the hold-outs and their political affiliations for outreach purposes. WSPA is assessing to see how it can use the media to either isolate ‘hold-out’ landlords and/or increase recognition of bear baiting as illegal activity. The audience for this media would be landlords and people attending bear baiting events (local media and maybe some national media). In particular, WSPA would like to target the Urdu-language press and get a few thoughtful articles of good quality in regional media (in the provinces of Sindh and Punjab). WSPA would like to see escalating interest from the provincial to regional to national levels. WSPA had aimed to raise awareness among overseas Pakistani university students through seminars or social media so that they would bring home the message of concern about bear baiting to their landlord families. This is proving a little bit challenging. WSPA looked at doing some outreach, for example, with the Oxford University Pakistan Society, the Pakistani Students Association at Harvard. At this point, WSPA just needs to approach the Pakistani overseas student community either in UK or in US in order to assess potential to mobilise them and in turn influence their family in Pakistan. (3) Engaging Politicians and influential people. Engaging with a select group of politicians, WSPA has identified as influential vis-à-vis the difficult landlords in Punjab and Sindh so that they can engage the landlords and discourage the practise of bearbaiting at private and public events. Separately, WSPA is also seeking to improve legal penalties and their implementation. Although bear baiting is illegal in Pakistan under the Prevention of Cruelty to Animals Act 1890 and a presidential decree, many related activities remain legal in some parts of the country; for example, in Sindh province the keeping of bears in captivity is not yet illegal. This creates a difficult situation for authorities and tends to result in inaction. WSPA is continuing to work with local lawyers to sensitise the judiciary to bear baiting offences and to address weaknesses in existing wildlife legislation. Through the filing of lawsuits in the Sharia Court and Islamabad High Court, WSPA is aiming to improve animal welfare protection in general and ensure that offenders are prosecuted. WSPA and BRC are also lobbying for the adoption of increased fines for bear baiting and a nationwide ban on keeping bears. 2012 has seen the development of provincial wildlife act drafts which now include bear baiting as punishable acts for each province, increasing enforcement power of authorities once the drafts are approved. Approval was estimated to be taking place in 2013 but was further postponed to 2014, which will require monitoring and pressuring through lawyers to keep the issue alive. 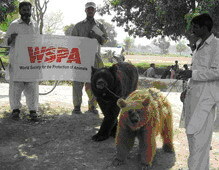 WSPA on the basis of a Memorandum of Understanding signed with the Khyber Pakhtunkhwa Government, is also trying to ensure that all leads are followed and acted upon, confiscations are made and that any confiscated bear are released in the WSPA built sanctuary; it was previously the Kund Park sanctuary but it was destroyed in the 2010 floods. It monitors the baiting events and reports any events detected to the relevant authorities to action. From 2005-6 to date, 46 potential events were detected and 74% averted. 12 events however still went ahead. 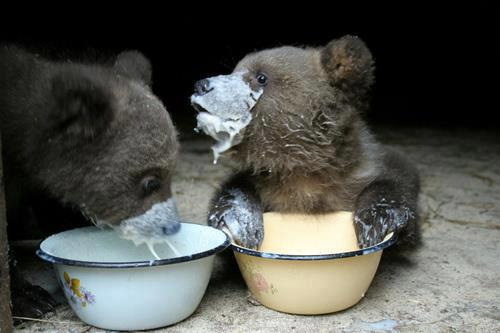 Over the years, the campaign successfully rescued many bears from the horrors of bear baiting. Every rescued bear needed special attention to treat injuries and diseases from the conditions they had been subjected to, but with a dedicated and expert staff at the Kund Park on the banks of the Indus River sanctuary, they were nursed back to health and able to live a comfortable life of freedom. This sanctuary, however, was destroyed during the 2010 floods and all, except two bears, were killed. A new sanctuary has now been established in Chakwal in the Punjab.